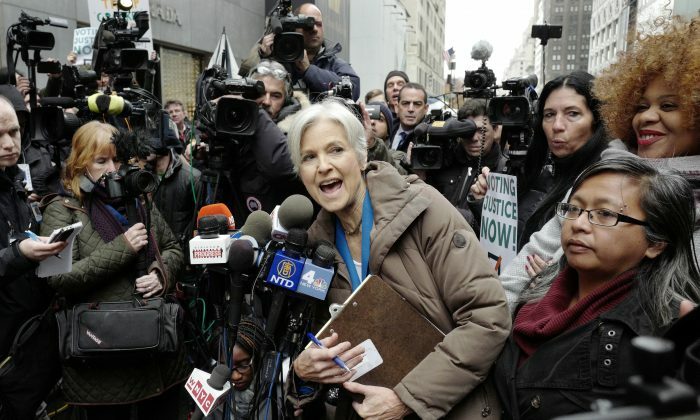 The Green Party and its former presidential candidate, Jill Stein, has asked a federal judge to order a recount of Pennsylvania’s Nov. 8 election result in what she has framed as an attempt to see whether voting machines and systems were hacked. A lawsuit filed in Philadelphia’s federal court both asked for a recount and a forensic examination of electronic voting machines used in many of Pennsylvania’s counties. The state’s election system, characterized by aging machines, was termed as “a national disgrace” by the Green Party in its suit, the Allentown Morning Call newspaper reported. The two-pronged lawsuit claimed that it is necessary to see if the election was compromised by hackers. Stein is pushing for recounts in Wisconsin, Michigan, and Pennsylvania—three states won narrowly by President-elect Donald Trump over rival Hillary Clinton. To cover the millions of dollars needed to carry out the recount, Stein raised more than $6.5 million via an online fundraiser. “Voters are forced to use vulnerable, hackable, antiquated technology banned in other states, then rely on the kindness of machines. There is no paper trail. Voting machines are electoral black sites: no one permits voters or candidates to examine them,” the Green Party’s lawsuit said, according to the report. But Pennsylvania officials said there is no evidence hackers compromised the election. Stein’s lawyers also haven’t offered any evidence. Before the federal lawsuit filing, Green Party-backed voters were forced to withdraw her court case in a Pennsylvania state court on Saturday, reported CBS News. They were forced to do so because the voters “are regular citizens of ordinary means” and can’t afford the $1 million bond ordered by the court by 5 p.m. on Monday. Wisconsin’s recount started last week, but according to the latest figures, there has been essentially no change whatsoever. A recount of Michigan is slated to start on Monday, said a judge in a ruling. Stein, who got about 1 percent of the vote in the three battleground states, made a public statement at the Trump Tower in Manhattan on Monday about the efforts. Trump, at the same time, assailed the Green Party’s push in Pennsylvania. “The Green Party just dropped its recount suit in Pennsylvania and is losing votes in Wisconsin recount. Just a Stein scam to raise money!” the president-elect tweeted.